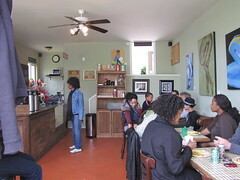 Next Thursday, April 7, a Beacon Hill neighborhood mixer will take place at The Station, 2533 16th Ave. S. Photo by Wendi. Don’t forget to check the BHB Events page for information on events this weekend and beyond, including this month’s Maple School Natural Area volunteer work party today at 10 a.m., Beacon Rocks! performer auditions tonight at 8 p.m., a Lewis Park work party tomorrow at 9 a.m., and a ROCKiT space swing dance party at the Garden House on Tuesday night at 7:30. We also want to give some advance notice of two Thursday evening events scheduled for April 7. At 5:30 p.m., neighbor Tess Martin will be hosting a neighborhood mixer at The Station, 2533 16th Ave. S. All are welcome. Come meet your neighbors and enjoy an extended Happy Hour or just some coffee. Then at 7 p.m., head over to the Beacon Hill Library a couple of blocks away for the monthly meeting of the North Beacon Hill Council. Stay tuned to the blog for information on this month’s NBHC meeting agenda.